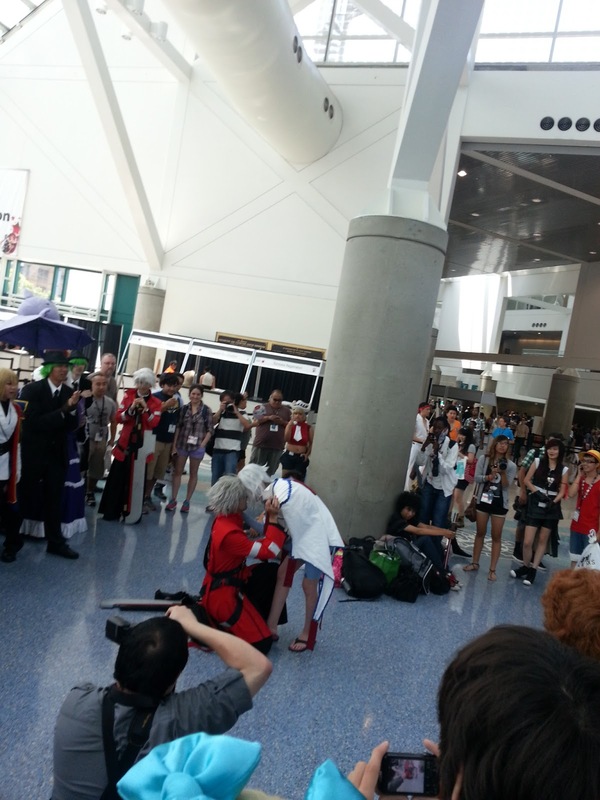 California Conventions Blog: Jade's "Why don't I take more photos" Anime Expo 2013 Review! So Day 0 for me was not very interesting, my friends and I showed up at 11AM and parked in West Hall parking lot, which cost us 15 dollars. What was interesting was when my brother showed up later and parked in the exact same parking lot, it was 20 dollars. It remained 20 dollars throughout the expo, so I guess they realized how much money they could make halfway through Day 0. My friends and I waited in line, (or should I say on the line? Access Control likes making people stand on the line instead of between them for some reason.) chatting with each other, making small talk with our neighbors in line and catching up with old friends. The doors opened at 2:55 for disabled fans, and at 3:10 for the large pre-reg line. Remarkably in the last five years I've attended this con, this was the closest they had gotten to actually opening the doors on time. My friends and I picked up our regular attendee badges, while we waited for my friend and blog buddy Cara to pick up her almighty Press badge, which took an incredibly long time, but I'm sure she'll talk about it in her review. While waiting for the Dealer's Hall to open, my friends and I decided (stupidly) to go in the giant mob of people to wait to go up the escalators. An interesting thing was when it was time to open, they would not let us in, but they let people on the second floor in. Personally I think it was because at the time there was an interview by a large news station taking place above us, and they wanted a background of the entire filled floor. When the interview was finally over, we were allowed the mob the doors of the Dealer's Hall. Day 2 was the only day I had a prop that required peace bonding. To be specific, the division of AX staff that does peace bonding on weapons is called Weapons Policy. I have always had issues with peace bonding in the past and was very reluctant to bring any more this year, but the one that I brought on Day 2 I built and expected to break at the con, so I did not mind if Weapons Policy damaged it in some way. I brought it to the table in West Hall, and placed it on the table. I know the staff member that was checking it was a first time staffer, because most of the people who volunteer on Weapons Policy go to my college, most of Weapons Policy volunteers were new, and that he did not know what my prop was made out of. But he was not rude about anything. My prop was a staff with a “blade” attached on the end that I made out of poster board, which I painted to look like metal. The staffer poked the blade twice and determined it was okay, and went on to poke the staff. They could not determine what it was made out of, and had to ask a fellow staffer if they knew what it was made of. My prop was made from Sculptamold, which is essentially a light weight Papier-mâché, and as soon as I told them it was approved, and they asked where I would like my weapon peace bonded. This was a big deal to me, because my very expensive prop last year was ruined. I happened to know the Weapons Policy manager before she became the manager, and was telling her about my experience last year, so she made it a point this year to tell her staffers to listen to requests this year, because she is also a fellow cosplayer who knows how hard we work on our props. I have read in another blogger's post that no wooden weapons were allowed. I'm confused at this, because I saw many people with wooden weapons, and even my brother had one. The only new thing Weapons Policy banned were bokken, (wooden practice swords) and wooden shinai. So I'm not quite sure how that means all wooden weapons were banned. Anyways, the day was filled with dealers hall, taking pictures, as well as getting pictures taken of me. My friend Dom had invited me to go to a Dungeon Master panel, (I can't remember the name of it and I can't find my program, sorry!) which was a DnD (Dungeons and Dragons) style “play” with the main “hero group” as five members of the audience whom wrote character cards. The event started at 6:30, and my friend Dom had left to line up at 5. That seems extremely early, and it is, but he was the first in line. The hosts and actors of the panel would occasionally come out, and handed out character sheets if the attendee wished to be part of the panel. What was interesting about this event was that it was ticketed. The tickets were free and you could get multiples of them, but they were not available at the door. When it was time to go in, Access Control blocked off the hallway, which I'm told is so no one can cut in line, though for this ticketed event it seemed a bit excessive, since no one could get in without a ticket. The event started on time, and was absolutely packed. The event started with a man in a black robe, who was our DM (Dungeon Master) and narrator. Five heroes were chosen from the character sheets, and then set about the storyline while narrated by the DM. One interesting thing about the event was the magic system. Everyone could use magic, but every spell needed an incantation. It had to rhyme and be more than a few lines, which is what stopped me from creating a character because I can't rhyme under pressure. The heroes had to rescue the kingdom's princess, whom was “kidnapped” by a group of bandits, but once they found her they discovered she became the bandit queen. The heroes then had the option to bring her back to the kingdom against her will, or join the bandits. They chose the latter, and that was the end of the play. It turns out the entire panel was run by a small theater company local to the Los Angeles area, which I thought was great, because it was a large organization supporting a small local one. The theater company had another panel the next day, but it was unfortunately sold out so I could not attend. The event ended around 8, and of course Dom and I were hungry. We went to the food trucks, but all of them had closed, so we decided to go on an adventure to Denny's. When we got there, we saw a huge line out the door, so we went next door to Fatburger. (Again for me, but I did not order anything the first day.) We walked back to the convention center, and met up with a group of friends, whom decided they wanted to go to an 18+ panel called Super Art Fight. Dom had left his ID in my car before we had left for Fatburger, so we went to grab it while my other friends held us seats. By the time we had gotten up to the room where it was held, there was no line and we were let in straight away. The panel was hilarious, there was a giant canvas in the middle of the stage, 3 artists, and a Wheel of Death which would give them topics. The panel was VERY accurately rated 18+, and for many reasons I will not be able to write about what I saw. The reason for hosting an 18+ panel was the next day they had another panel that was not 18+, so they had to get certain...things out of their system. Day 3! Beginning of the day I went to the Blazblue gathering. Posing, picture taking, the standard thing at a gathering. But what was different was a proposal! I couldn't hear much of what happened, but I do know she said yes. By this early stage, my cosplay shoes were already killing my feet, so I waited around until it was time for my gathering. After the gathering I had planned on changing back into regular clothes, but my friends had an extra cosplay sitting in their car, (Taokaka from Blazblue) So I asked to borrow it and wore that for the remainder of the day. The only other plans I had besides the gathering were to go to the non 18+ panel of Super Art Fight. It was really odd, the line for it was in the room across from it, with people sitting on the floor in an overly complicated line system. While I thought this was ridiculous, it was necessary because there would not be enough room for everyone to line up at the door, but they were also capping how many people could go into the event, which was absolutely filled. Super Art Fight starts out with two artists, whom draw on a giant canvas in the middle of the room, but they “fight” with their drawings. One artist would have their drawing punching the other character, etc. They also had a Wheel of Death, which would spin to a topic they had to incorporate into their drawing. There were a total of 4 artists, (though they had more) and 3 rounds. The winners of round 1 and 2 would then face off in round 3. The winner of Super Art Fight was a famous Tumblr artist, whose name escapes my head. The Super Art Fight group is a small group from the East coast. This was their first time on the West coast with Super Art Fight, so it was a large milestone for them. I know I took photos, but unfortunately they are on my friend's camera and he has not gotten around to uploading them. The last day of AX, was filled with shopping. Lots and lots of shopping. Other than shopping, there wasn't much to do besides the video rooms. I didn't attend anything besides the Dealer's Hall, because over the span of the con my feet had gone through torture, so I was uninterested in attending anything day 4 had to offer. Overall, I was not angry with Anime Expo staff. LACC staff, was understandable but unnecessary. What did annoy me was being treated like cattle when it came to lines, but I know it is not staffers' faults. It is the higher ups of the convention, whom seem to not care about convention goers individually, but only care for the numbers. Anime Expo is no longer a convention for fans, it's an exposition for the industry. There were no fan run panels, only industry panels. They did have some small groups like the local theater group, as well as Super Art Fight, but I feel like some fan panels should be allowed.